“We are rich with data we didn’t have only ten years ago” Sally Capp, Melbourne Lord Mayor speaking at the Alumni Women’s Lunch 2018. 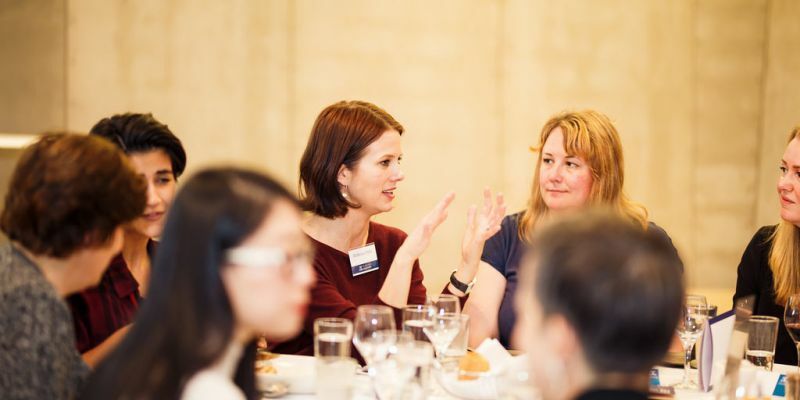 Alumni and friends of the Faculty of Business and Economics came together at the annual women’s lunch to discuss what it takes to succeed in the workplace of the future. Conversations about the future of work influenced by automation and shifts in the labour market have permeated business boardrooms and the media for some time now. Slowly we are seeing a positive shift in the rhetoric towards the more agile worker and the opportunities in digital disruption. Add to this, the growing conversations around workplace gender equality and our expert panel were left with a smorgasbord of topics. 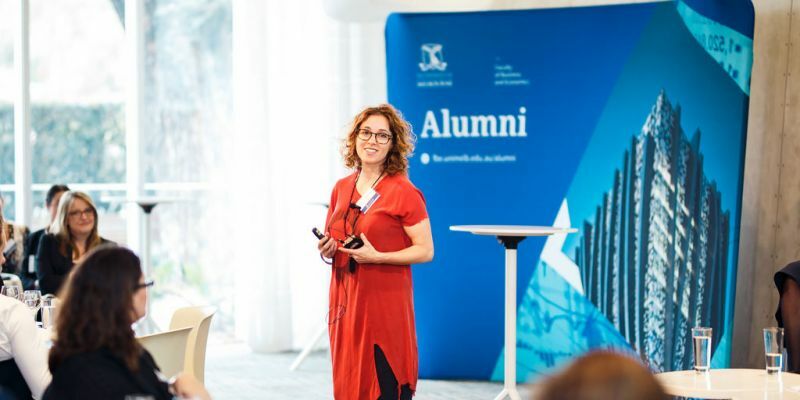 Moderated by the newly elected Lord Mayor of Melbourne, Sally Capp (BCom 1991, LLB (Hons) 1991) – an alumnus of the Faculty who has kicked business, personal and now political goals – the panel consisted of Amanda Flouch (BCom 1999, BA 1999) Partner, Human Capital, Deloitte, Dr Victor Sojo (PhD 2012), Centre for Workplace Leadership at the University of Melbourne, and Barbara Hyman (MBA 1996), Chief Executive Officer, PredictiveHire. 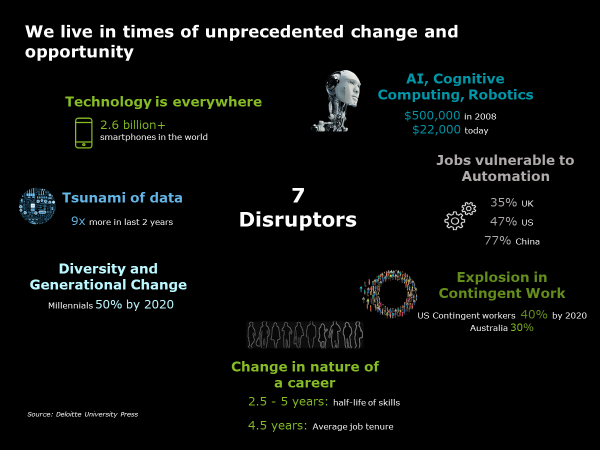 Amanda Flouch says we know disruption is coming. Our success lies in how we respond. According to Amanda Flouch the future of work is already here. The question is: how do we respond? Female workforce participation is on the rise but representation at senior levels remains low and the gender pay gap shows no signs of abating. Data insights helps us to better understand the barriers. Victor Sojo’s work on occupational segregation highlights the need for more women in traditionally male dominated industries. “Maths, engineering…these are typically better paid and the lack of women studying and then working in these fields is contributing significantly to the gender pay gap,” explained Victor. But, clearly, it’s not just about getting more women into higher paid industries or more senior roles within those industries. For women to succeed in the workplace of the future, we need to use data insights to simultaneously transform traditionally female dominated industries like the health and community sector. Our population is ageing and these careers will become increasingly important so it is not just about individual success, it is about service orientation. Change will not happen organically – organisations need to use data insights to respond and deliver more diverse and flexible workplaces that enable full participation in less traditional but equally effective ways. Barbara Hyman led REA Group through a significant cultural overhaul from 2015 with a clear value proposition at the core which all employees were part of developing and living. “Your purpose has to be more elevating than making more money for stakeholders. Employees, especially millennials, want to make a difference,” said Barb. And, as an audience member pointed out, this is traditionally a trait valued more by women at work which underpins their dominance in carer type industries. Unfortunately, this often means a trade-off between professional fulfillment and financial success. If we follow Barb’s lead – and she certainly embodies success in the workplace – this trade off isn’t necessary IF organisations change the way they envision success. Alongside a more empowering workplace culture, organisations must respond to their role in lifelong learning and encourage their employees to upskill or reskill. We are seeing a diverse offering from universities but organisations also need to facilitate learning outside the traditional career break style options. Success can be supported by the surrounding structures but individual response is key. With flexibility comes increased accountability. For truly flexible workplaces to exist, both men and women must embrace this flexibility which will require a social and, in many cases, individual change . There is still a pervasive concern that having children can derail or delay careers but Amanda Hyman is an example of achieving personal and professional success on her terms. Sally, who has transitioned from business mogul to her new-found success in local politics said that success is fluid. “Some of the most well-paid people are the unhappiest,” she explained. The message from our panel was clear. Don’t be afraid of new technology. Embrace it to succeed in the workplace of the future. View all the images from the event here. Remember to leverage your alumni network to continue to succeed in your workplace. Keep your contact details up to date to ensure you hear about the latest alumni events, activities and news.